I had quite a stressful July. There was a lot going on and I didn’t know what to do. Finally I decided to fall back on my reliable dump list and put together a to do list of everything. It took an entire sheet of paper! But then, I discovered the secret that made me SO much more productive! After I listed ALL of the things that I needed to get done, I first color coded them by category: house, personal, camping, An ADD Woman, and Face to Face, which is a charity that I volunteer for. The prioritizing really helped. Obviously, the #1 things needed to get done first. 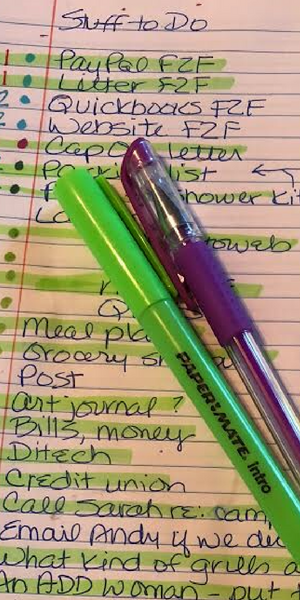 Every time I found myself headed towards another item on the list – usually something easier – I went back and found a #1 priority item and did that instead. Way to be productive! You can see that I highlighted the things I got done. To me, that’s encouraging to see all those highlighted items. There are still some things that didn’t get done, but that’s OK. A few of the items weren’t due until August, and a few I just didn’t get to in time. The important thing is that most got done and ALL of the important ones were completed. By the way, this is something that I usually do in my planner, but I tend to only list a few things. With a list this big, I needed something with more room to write. This was so successful that I intend to do it again for the month of August, but I am going to try to find a way to add it to my planner so that I can assign tasks to certain days rather than just relying on finding time to do them. What do you think? Is this something you do or would try? That looks amazing. My usual planning gets sidetracked with the umpteen requests from the hubby and the 3 yes I said 3 teenagers pulling me in many different directions. So my list if I’m lucky gets set aside, and I then invariably “forget” to do the important stuff. Only to hear “What’s for dinner?” Which is a problem because I forgot to take out something from the freezer. Ugh. I can’t tell you what a revelation this was to me! I mean, prioritizing has been around forever, right, but to me, it was just too – I don’t know – nitpicky or something executive types did. I couldn’t be bothered. Wow. I do have to say, I am not doing as well with it this month, but I don’t have the pressure on me that I did last month. Plus there’s that whole “I need a special planner or notebook for this” thing I go through. Oh, and my dinners get planned before I go shopping and then get added to my planner by day, based on whatever else is going on that day. Wednesday is my birthday and I should have some fancy dinner, right? But no. I have 2 doctor appointments, so burgers it is. She has a few videos on ADHD that are helpful for parents of children with ADHD or for individuals with ADHD as well. Thank you for sharing Megan! I will definitely check them out!